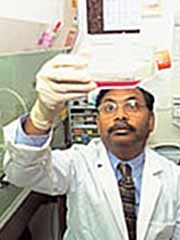 Mohan Raizada, has become well-known for his research in the cellular, molecular and genetic aspects of hypertension. Raizada, who joined the faculty in 1981, is leading research to study the cellular and molecular mechanisms of catecholamines and angiotensin, naturally occurring hormones that play roles in regulating high blood pressure. His studies have been instrumental in better understanding how these hormones interact with each other in the brain to control blood pressure.